This is the book I am working on at the moment, it has been a few weeks now since I started working on this book, and I hope to finish it before Christmas if all goes well. There have been some hiccups along the way, but as of today, it seemed to be alright when I left it. It has been a book for me to practice board reattachment, which is a series of lectures we have been having for the past couple of weeks. Here I am going to list the work I have been doing on the book for my journal and hopefully include some pictures of how it has advanced. The book has both boards detached and a severely deteriorated spine, as you can see in the photograph, the end papers are detached with some minor paper repairs necessary. The end bands and end caps have also deteriorated and are no longer present, through there is some evidence of their initial present. A full account of the damage is in my documentation report. The first step I was advised to take was to prepare some toned tissue for the repairs to the cover and also make any paper repairs. These included reattaching the end papers with the use of a japanese hinge on each side. This worked very well and has formed a discreet and strong attachment. Toned japanese tissue for cover repairs. Reattachment of the endpapers using japanese tissue hinges. We have recently had a fascinating day with Alan Buchanon on making and using pulp papers for paper repairs as an alternative to japanese and western paper repairs. This is a technique that Alan has honed to a great art and precise formula that allows any conservator to give it a go an come out with a good and useable result. To start with we made and dyed paper at the same time, this was done using shreds of a high grade of cotton rag paper to make the pulp and a precise mixture of dyes to get the colour. The percentage of the colour is essential a the lower the percentage, the lighter the colour. There were about six colour charts using a different percentage of dye for each chart, these can be seen in the photographs below. Once the paper was made, we then moved on to making the pulp. By take the object and comparing it to the charts, it was possible to see what colour match the object best. Once found, the chart then gave grammages of how much paper was needed from each colour in that percentage, these could be weighed out and blended together like a recipe! At this point a pulp was ready, and after making small samples and adding any colours if necessary, we were ready to repair. This was done using a powerful suction table, on which the object sat with the area to be repair masked out of melinex in order to prevent any damage to the surrounding area. Using a pippet, the pulp was then squirted into the area the be mended and built up gradually to the required amount. Once this was reached, the use of a hair fryer would dry out the final parts of the repair, and it was done! I was unsure how strong these repairs would be as there is no adhesive involved. Alan assured me that the combination of the suction of the table and the hair dryer meant thy the cotton fibres would form a very strong covalent bond with the cotton fibres in the paper. This was not necessarily the same with wood pulp papers, which might need a small amount of adhesive mixed into the pulp to ensure it adheres enough. For a while I have been trying to think of something I could do on a weekly basis to keep my blog up and running and relevant, so I thought I might do a series of instructions. These will be to let people know exactly what I am learning at the moment, It will also help me remember everything I am learning, and means I have notes for myself in the future! So this week I am starting on wet paper repairs, as this is something I am working on at the moment and have had recent instruction in. Prior to using the wet repair method, it is necessary to check that the object will not be effected by water, as it may have fugitive media on it or the water may cause tidelines, so relevant tests and humidification must be done first. Japanese tissues, such as Spider and Tengujo are very good for paper conservation. They are archival papers and have an alkali reserve within them, which will lower any acidity in the object. They are also made from very thin, very long fibres. This means that they can often be invisible on the repair due to their weight, but strong at the same time and will provide support for the object where necessary. Paper fibres are essential to the repairs, you cannot just cut the repair tissue or paper with a blade, as the harsh line will lift up from the object after time, you need a frayed edge of fibres to adhere properly. This is done using a water pen or a paint brush and water. You must draw a line using water onto the tissue or paper where you want to cut, you can then tear the tissue along this line, giving you a soft edge that will adhere better. When cutting infills, it is done in the same way – you can put the object on a light box with a piece of melinex on top to protect it, you can then trace an accurate line with a water pen directly onto the repair tissue/paper on top of the object and then tear it. 1. When repairing tears on the object, primarily, the tear must be tacked together using a small bit of wheat starch paste, this is done with a very small overlap as it will pull apart when it dries. 2. Starting out on the reverse (verso), draw out and cut a small piece of tissue using the lightbox method described above. For any tear bigger than an inch, it is better to use small pieces of tissue, letting each one dry before applying the next, as longer pieces can cause the object to cockle. 3. Trim the extra long fibres using scissors, as then will be too long to pick up the paste. 4. Paste the small piece of tissue on a piece of scrap melinex, leaving a tiny area at the end to allow you to pick it up. 5. Lift the tissue from the melinex and place onto object, and flatten down using a bonefolder on top of bondina and archival blotter, then weigh it down for a couple of minutes. 6. Repeat this process on front (recto). 7. Once dry, trim any excess tissue from the edge of the object. 1. Find an infill piece of similar but lighter paper, if the object is antique laid paper, it should be repaired with the same type of paper. If it is a modern paper, it will be heavily sized, so should be put in bath of hot water to remove any size, and dried and pressed appropriately. 2. Cut the repair paper to fit the missing section using the lightbox method described above. 3. Tack the new infill piece to the object using wheat starch paste. 4. When dry, cut a piece of tissue that will cover the back of the infill and about 3/4mm of the object itself, this is because the tacking of the object alone will not be enough to keep the infill there. 5. Paste this piece of tissue to the object and infill on the verso and allow to dry under a weight, blotter and bondina. 6. Once dry check whether another piece of tissue is needed on the front – ideally not, but it may be necessary. Please be aware these are not official instructions and should not be followed as or in replacement of professional instruction. Well this term we have really started to conserve objects, which has been great, we’ve had some great tuition from a very skilled paper conservator, who has been guiding us through the different techniques. Friday we were working on wet paper repairs, which uses japanese tissues and wheat starch paste to repair tears and form infills where paper is missing. This is an old piece of laid paper, from a book. Initially it had two tears and two missing sections (not including the hole in the middle which I haven’t fixed yet! ), all of which I have now repaired. The japanese tissue used for the repair was called Tangujo, and the paper used for the infills was an ‘orphan’ piece of handmade antique laid paper. Unfortunately when doing the corner repair I failed to correctly line up the laid lines, and mine’s gone a bit skew-whiff, which is a bit pants and what seems like a lost opportunity to get it right. Mph. The infill paper was extremely crinkled, which meant a great opportunity to practice humidification, which worked pretty well even if I do say so myself! Over the last few weeks, we have been introduced to the art of paper conservation at college. 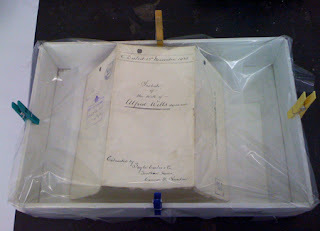 Paper conservation is a key part of the craft of a book conservator, as, quite obviously, the majority of a book is paper! We have been learning how to recognize the differences between different types of paper, including hand made and machine made papers, and to recognize the defects in a sheet of paper, such as the difference between mould and rust spots. Many old papers will have fragments of iron in their fibres, which over time will rust, causing reddish patches. This is an integral part of the paper structure and will effect the paper from the inside out, unlike mould, which starts as a surface problem (this may then go through to the other side of the paper, but not necessarily). 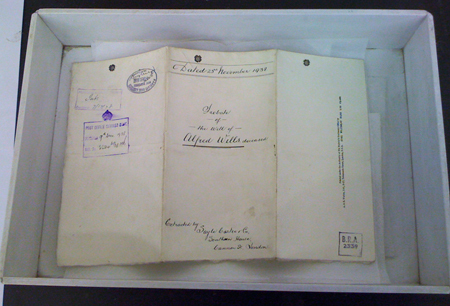 I have been working on a probate document (pictured), which has manuscript, coloured inks, printing, embossed stamps, deckled edges and a very early form of photocopying (not technically photocopying) – a little bit of everything that has to be taken into consideration when conserving (e.g., you cannot do a full bath wash, as all the manuscript ink would run and the embossed stamps would be lost). In the pictures below I have been humidifying it to relax the folds. I then put it under a couple of weights to reduce the folds further.